After a challenging 2016, the European environment continued to change in 2017. We were heartened by pro- EU election results in France and the Netherlands, the ratification of CETA and the EU’s continued commitment to international trade. 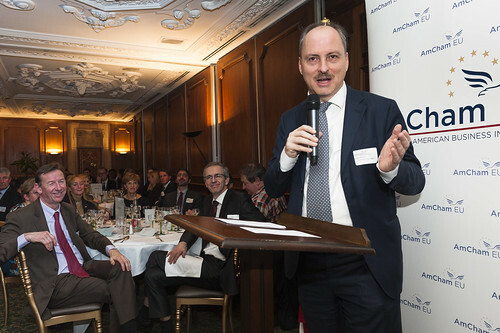 At the same time, the triggering of Article 50 and populist and anti-business sentiment in many parts of the EU required the continued engagement of AmCham EU. In light of the external environment, we focused on four flagship issues: the Transatlantic Economic Relationship, The Benefits of Trade, Single Market and Brexit. Highly active throughout 2017, the Brexit Task Force advocated for an ambitious Brexit outcome in multiple meetings with senior officials from the EU and UK negotiating teams. It welcomed a delegation of 11 MPs from the UK House of Commons’ International Trade committee, and met with representatives from some 15 Member States and other key decision-makers. The Task Force also published four position papers – including an authoritative position on the negotiations with input from 15 AmCham EU committees – as well as press releases and other communications. Coverage of the Task Force’s advocacy was featured in leading news outlets including the BBC, Financial Times and Politico. At the launch of AmCham EU’s brochure ‘Security and Defence – Together for European Growth’, Sir Julian King, Commissioner for the Security Union, stressed the important role the transatlantic relationship plays in security and defence. Commissioner King welcomed industry’s engagement with policy-makers, and set out the key priorities for building the Security Union. 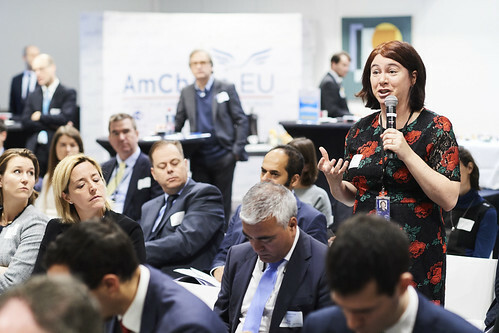 AmCham EU hosted a delegation of 65 members from 60 member companies at the European Parliament’s monthly plenary meeting in Strasbourg, where participants exchanged views with more than 90 MEPs from across the political spectrum. The delegation served as a reminder to decision-makers that AmCham EU members are dedicated to the transatlantic relationship as a vehicle for growth and prosperity, both in the EU and the US, even in times of uncertainty. The delegation also marked the release of the AmCham EU study, ‘The EU Single Market: Impact on Member States’. Following an introduction to the study by the author, Patrice Muller of London Economics, leading MEPs from the five main political groups discussed its findings in a panel entitled, ‘The Single Market of Tomorrow’. The study, featuring a foreword by Jyrki Katainen, Vice-President for Jobs, Growth, Investment and Competitiveness, European Commission. 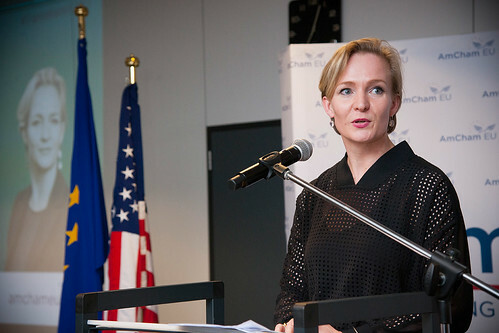 Marietje Schaake (ALDE, NL) gave the keynote address at the Transatlantic Reception, where she spoke about the value of the transatlantic relationship in a time of uncertainty and change. In her remarks, she concluded that the future transatlantic relationship will be increasingly based on links between companies, citizens and civil society rather than purely government-to-government relations. 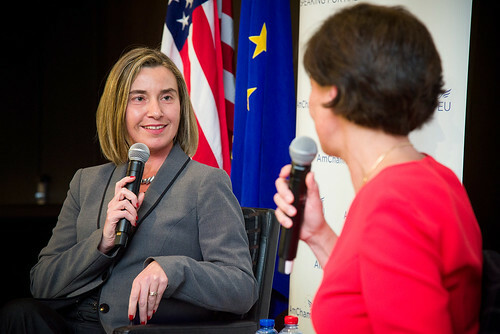 The Transatlantic Conference examined the implications of Brexit on the EU-US relationship, and featured a number of panels and keynote speakers on the subject. The event saw the launch of the annual Transatlantic Economy Survey of Jobs, Trade and Investment between the US and Europe, which showed that despite many global challenges and uncertainties, both regions are experiencing growth, confident markets and decreasing employment rates. The annual Transatlantic Award was presented to The Honorable Anthony L. Gardner, US Ambassador to the EU. The award is given to an individual who, in the view of AmCham EU members, has significantly contributed to the transatlantic relationship. In March, AmCham EU officially launched InvestedinEurope.eu, which demonstrates the commitment of American businesses to European citizens and communities. Through storytelling, the website highlights AmCham EU member companies’ corporate social responsibility initiatives and investments throughout Europe. AmCham EU was presented with the AmChams in Europe (ACE) Creative Network Award for InvestedinEurope.eu on Friday, 13 October in Dublin. The Creative Network Award was created in 2014 with the aim of incentivising AmChams to share creative initiatives and projects for the benefit of AmChams throughout the ACE Network. 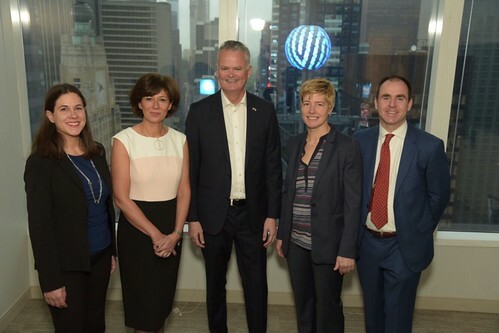 Susan Danger, CEO, travelled to New York City on behalf of AmCham EU. While there, Ms Danger spoke on a panel for AmCham Ireland’s ‘Transatlantic Conversation’ event with the International Irish Business Board, had outreach meetings with British American Business, the United States Council for International Business and AmCham Finland’s New York Office. Ms Danger also met with EU Ambassador to the UN, João Vale de Almeida and Klaus Sorensen, former European Commission Director-General. 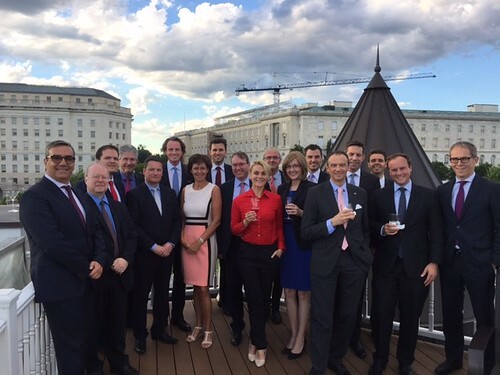 The following week, Susan Danger, CEO, and Tim Adamson, Senior Policy Adviser, joined the AmChams in Europe delegation to Washington, DC, where the US Chamber of Commerce hosted a reception at their offi ces for the AmChams in Europe, featuring an address by Dan Mullaney, Assistant United States Trade Representative for Europe and the Middle East. While in Washington, AmCham EU also participated in meetings with representatives of the Departments of State and Commerce, the United States Trade Representative and a series of meetings on the Hill. They also met with the EU Ambassador to the US, David O’Sullivan, and attended the Europe Day reception at the Ambassador’s residence. 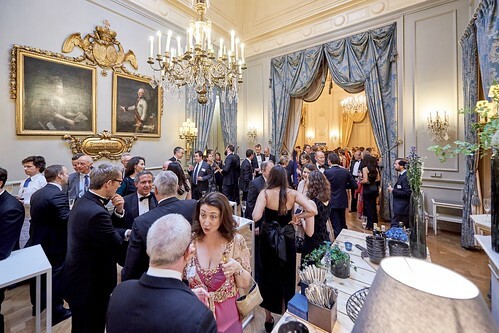 AmCham EU welcomed more than 250 government officials, member companies and other stakeholders to the Concert Noble for a celebration of youth, entrepreneurship and the arts. The event included the presentation of the 5th annual Youth Entrepreneurship Award by Nando Cesarone, President, UPS Europe. The winner of this year’s award, Oculus, a Romanian start-up founded by 18-year-old Tudor Popa, created the Mitra glasses, device that provides essential aid and safety to visually impaired people during movement. Another highlight of the evening included a cello concert by the laureates of the Queen Elisabeth International Music Competition. 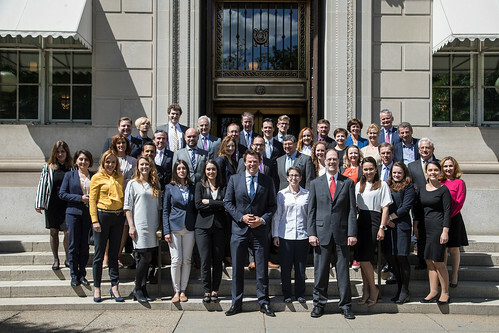 A delegation of AmCham EU members embarked on a visit to Washington, DC for a series of meetings on the transatlantic relationship, with a focus on financial services. Highlights included meetings on Capitol Hill with Congressman Joe Wilson, Co-Chair of the EU Caucus; Congresswoman Nancy Pelosi, House Minority Leader; and a congressional reception, co-hosted with the US Chamber of Commerce and Congressman Dave Reichert, Chairman of the House Ways and Means Subcommittee on Trade. Meetings were also held with the White House administration, including National Security Council representative Julia Friedlander; representatives of the Departments of State, Commerce and the Office of the US Trade Representative; meetings with the EU Ambassador to the US, David O’Sullivan and his delegation; and other industry associations. A new era for EU trade policy? Throughout 2017, AmCham EU ran an advocacy campaign focused on building bridges between business and other stakeholders on the role of trade in society. A key highlight of this work was hosting a panel on EU trade policy with representatives from civil society, government and business alike. In the context of rising populism, protectionism and a fast-changing global economy, speakers discussed the future for EU trade. The panel was followed by a conversation with Maria Åsenius, Head of Cabinet to EU Trade Commissioner Cecilia Malmström, who reaffirmed the European Commission’s goal of an ambitious future EU trade policy. While a transatlantic trade deal has not come to fruition, EUUS trade continues to be robust, and Ms Åsenius called on companies speak out more on the benefits of trade. 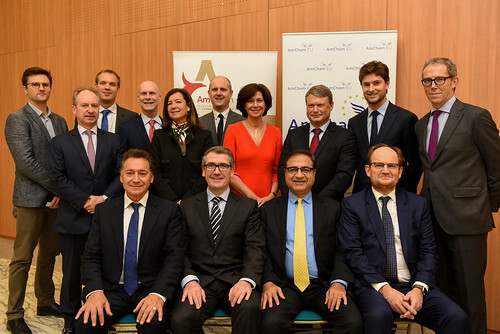 AmCham EU Executive Council’s fall plenary was held in Paris, where members met with several senior French government officials from a range of ministries to discuss the role of France in Europe. The members were received by a forward-looking administration determined to put France at the forefront of the digitalisation of the global economy. The meetings were jointly organised with AmCham France, an excellent example of cooperation with the national AmChams in Europe. While there, the Executive Council also participated in an event hosted by the Paris Region and AmCham France on investing in the region, France and Europe. AmCham EU hosted its fifth annual Transatlantic Digital Economy Conference ‘Embracing the Digital Transformation’, welcoming 120 participants. Roberto Viola, Director General for DG Connect, European Commission, delivered the opening keynote address. He highlighted the crucial role transatlantic cooperation has in strengthening the Digital Single Market and catalysing the digital transformation. The panels focused on creating a smart policy environment for innovation, investment and competition, free flow of data and the benefits of the Internet of Things. The event concluded with a closing address from Adam Shub, Chargé d’Affaires, US Mission to the EU, who outlined key priorities on EU digital policy, including data flows, privacy, standards and cybersecurity. With 20 committees and groups, AmCham EU works on a wide range of policy issues at any given time. In 2016 the European Parliament Outreach Task Force continued to complement the work of AmCham EU’s committees by shaping advocacy and facilitating outreach to the European Parliament, strengthening ties between AmCham EU and MEPs and developing closer relations with the national delegations and the political groups. In total AmCham EU met with over 230 individual MEPs and organised seven delegations to the plenary sessions in Strasbourg. The Executive Council (ExCo) is a forum of senior executives responsible for the European operations of some of AmCham EU’s largest member companies. The mission of ExCo is to strive for the continuous improvement of European global competitiveness, through targeted dialogue at the highest levels between its members and senior policy-makers of the EU institutions, Member States, and international organisations. The group was chaired by Christian Morales, Intel, along with Vice-Chairs Harry van Dorenmalen, IBM; Aongus Hegarty, Dell; Marco Comastri, CA Technologies; Reiner Roghmann, Dow Chemical; and Pierre Dejoux, UTC. 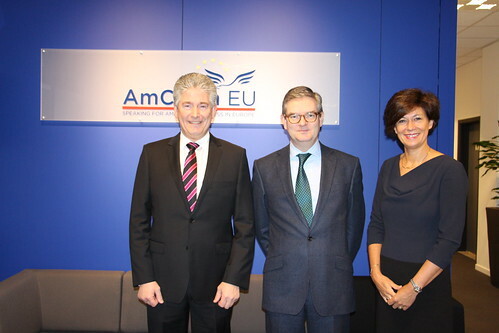 AmCham EU’s Presidency Group works to influence the agenda of the European Council. It initiates substantive policy dialogues with national officials charged with the upcoming Presidency of the Council of the European Union by meeting with the relevant permanent representation in Brussels. This is followed by a delegation visit to the member state capital, during which a report with recommendations to the presidency is presented. AmChams in Europe (ACE) is the umbrella body for American Chambers in Europe and Eurasia. Representatives meet two to three times per year to exchange best practices, share information on key issues facing US businesses operating in Europe and discuss opportunities for policy cooperation. AmCham EU leads policy coordination on issues of interest to members of the AmChams in Europe network, through regular calls and policy updates, and through the support of the organisation of national AmCham events in key policy areas.